Rejoice ice anglers, your old standbys are available in new colors! Jigging Rap®s now come in more natural looks and Rippin’ Rap®s sport UV colors previously available only in the smaller Ultra Light line. Size 05, 06 and 07 Rippin’ Raps are now available in Green Tiger UV, Pink Tiger UV and Redfire Crawdad. The latter pattern features a dark red back, chartreuse belly, craw-shell lines and gray specks. The Green Tiger UV pattern features a light green back with darker green tiger stripes, white sides, and an orange belly. The Pink Tiger UV pattern features a light yellow back with dark pink tiger stripes, a dark pink head, and a white belly. The UV colors, previously available only in size 04 — the Ultra Light Rippin’ Rap series — “will be killer on ice-fishing factories with stained water, like Upper Red and Lake of the Woods,” says ICE FORCE® Pro-Staffer Brad Hawthorne, who guides on those frozen waters. All five Jigging Raps sizes are now available in Redfire Crawdad, Pearl White, Bluegill, Regal Shad, Helsinki Shad and Purpledescent. The Regal Shad pattern features a pinkish-purple back, horizontal chartreuse side stripes and a white belly. The Helsinki Shad pattern features a metallic blue back, horizontal chartreuse side stripes and a white belly. The Purpledescent pattern features a black-and white-speckled purple back, a chartreuse/black nose, pink throat and white belly. Featuring flat, skinny sides and a deep-belly profile designed to dive and rip, Rippin’ Raps flutter on the drop with a hard-vibrating action accented by a loud, distinctive BB rattle system. Textured scales and gills with deep-set 3D holographic eyes seal the deal. To catch walleyes, drop a Rippin’ Rap over hard-bottom areas, first giving the bait three big rips and then shaking it in place ever so slightly, Hawthorne instructs. The initial rips will call in fish; the subtle shaking will trigger bites. The correct stroke is slight so it does not rattle the otherwise noisy bait. Hard-bottom areas feature clam beds, zebra mussel beds, bedrock or hard clay. Such spots are relatively easy for anglers to locate with maps and electronics, Hawthorne says. 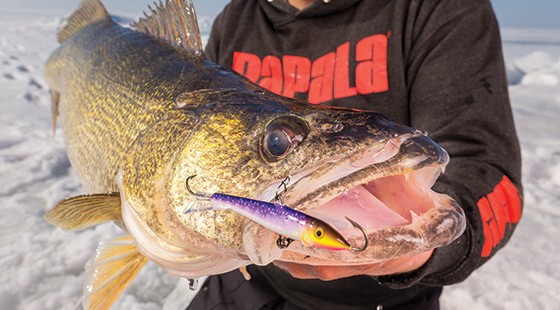 While the new UV colors often work best in stained waters, Hawthorne suggests stocking up on Rippin’ Raps in the more natural color patterns as well — especially if you will also be fishing water bodies with clearer water, like Mille Lacs. Fish Rippin’ Raps on 6-pound-test Sufix® Ice Magic® Mono. But don’t tie directly to your main line, Hawthorne advises. “That’s really key, or you’ll mess up a whole spool of line with this tactic,” he says. First, cut an 18-inch leader from the main line and tie it to a small swivel. Then tie your leader directly to a tiny quick clip. Attach the clip not to the split ring on the Rippin’ Rap, but to the keeper that the split ring is attached to. This will prevent the back end of the hook from coming up and grabbing the line. Weighted and balanced to perfection, Jigging Raps simulate the erratic characteristics of a wounded baitfish better than any other lure under the ice. They also “cover a lot of real estate,” Nelson notes. “They can swim off to the sides and cover some ground, while behaving very naturally in helping to corral circling fish,” he explains. Although Jigging Raps are simple to use, “guys fish it wrong all the time,” says Tom Neustrom, a Freshwater Fishing Hall of Fame guide. Mistakes include lifting it too high and moving it too much. Always tie a Jigging Rap to a leader line attached to your main line by barrel swivel. “Otherwise, its going to twist your line,” Neustrom explains. Three feet is a good leader length. Another tip? Don’t raise your Jigging Rap too far above the fish, Neustrom says — “They want something that’s right in front of them.” He and Nelson both usually tip Jigging Rap belly trebles with minnow heads. This entry was posted in Products and tagged Brad Hawthorne, ICE FORCE, Jigging Rap, Joel Nelson, Rippin’ Rap. Bookmark the permalink.